The end of the school year always brought joy and sadness to those girls leaving Chevy Chase Junior College. Some would be back at the end of the summer, others would graduate and move on to their new lives. 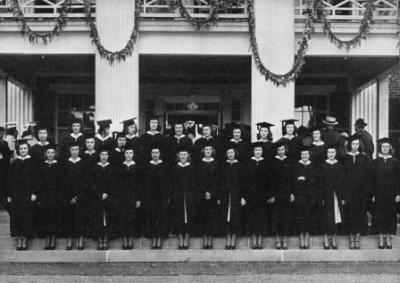 But for the Chevy girls leaving in June 1950, none expected that this would be the last graduation. Returning students were surprised to learn that the school would not open in the fall. In 1951, the following year, the property was sold to the 4-H Foundation. In a brochure titled "My Two Years at Chevy Chase," produced not long before the school closed, many recent graduates detailed their experiences at the school, how their time there prepared them for their future, and the meaning it still held in their lives. Their happy memories of their "two years" at Chevy Chase, printed next to their smiling graduation photos, is a strong contrast with the financial situation faced by administrators at the end of the 1950 school year. Click here to view a PDF of the brochure. In 1946, just a few years before, Chevy Chase celebrated the largest enrollment in its history, but this increase was apparently short-lived and tuition was insufficient to cover operating costs. The lack of financial resources may have stemmed from a postwar campus building campaign. Without the ability to further increase attendance, the school may not have been able to raise the necessary funds. And the Korean War, a “hot spot” in the new Cold War between super-powers added to the uncertainty.